This is the slice I made for Lauren’s circus party as mentioned in yesterday’s post. It was absolutely delicious, but very full on and not for those who aren’t a fan of the whole salty/sweet thing. 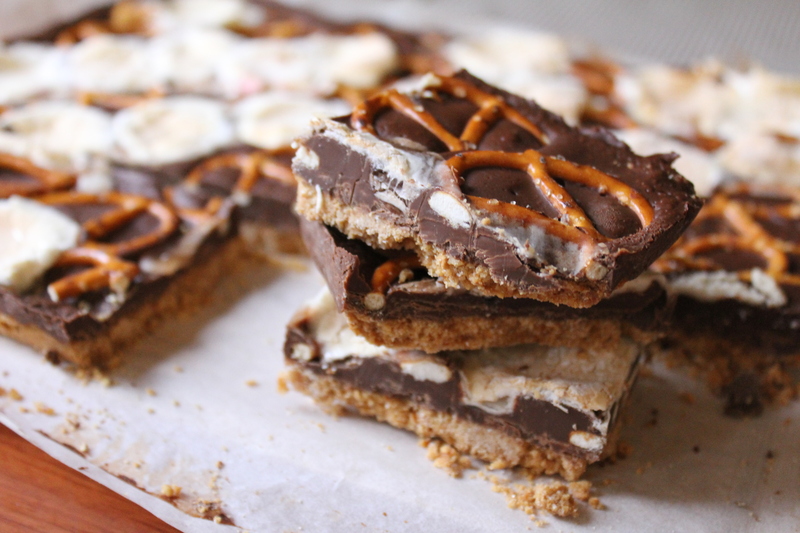 The recipe is from here with a few adjustments (a biscuit crust and the addition of marshmallows). Preheat the oven to 170°C. Line a 9″ x 13″ pan with baking paper, leaving long ends to use to remove the bars from the pan. Whisk together the ground biscuits, ground pretzels and sugar until well combined. Mix in the melted butter using your fingers to evenly distribute it. You should have a soft but not wet dough. Press the dough evenly into the pan and bake for 10 to 12 minutes. While the crust cooks make the filling. In a double boiler or using a microwave melt the chocolate chips, stirring every 30 seconds until smooth and creamy. Add the peanut butter and stir until well combined and smooth. Pour the filling over the warm crust and spread out evenly. Tap the pan on the counter to allow air bubbles to escape (I forgot to do this and it was fine). 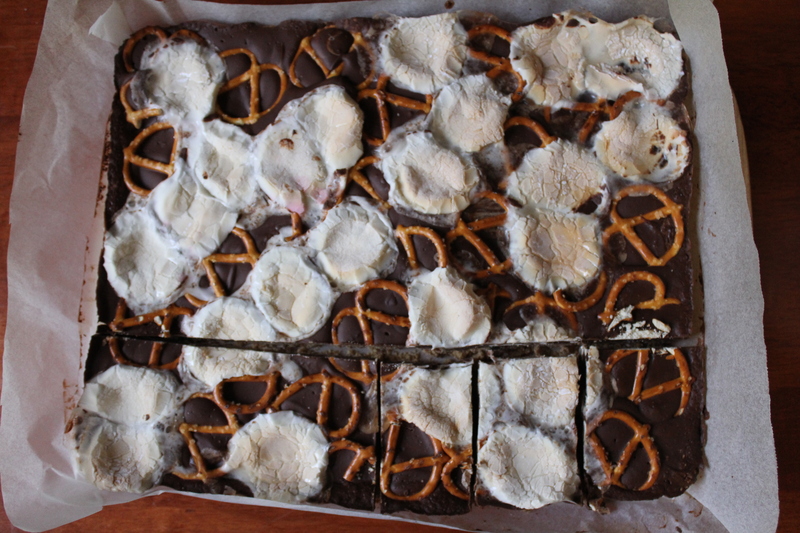 Sprinkle the remaining pretzels and the marshmallows on top and slightly press them down so they stick in the chocolate. Put the tray back into the oven for 5-10 minutes or until the marshmallows melt and go a nice golden colour. After that pull the tray out of the oven and chill in the freezer for 1 hour. I then put the tray in the fridge until I was almost ready to go to the party. Use the baking paper to lift the bars out of the pan onto a cutting board. Use a large knife to slice into squares or bars. Serve frozen, chilled or at room temperature. So good! 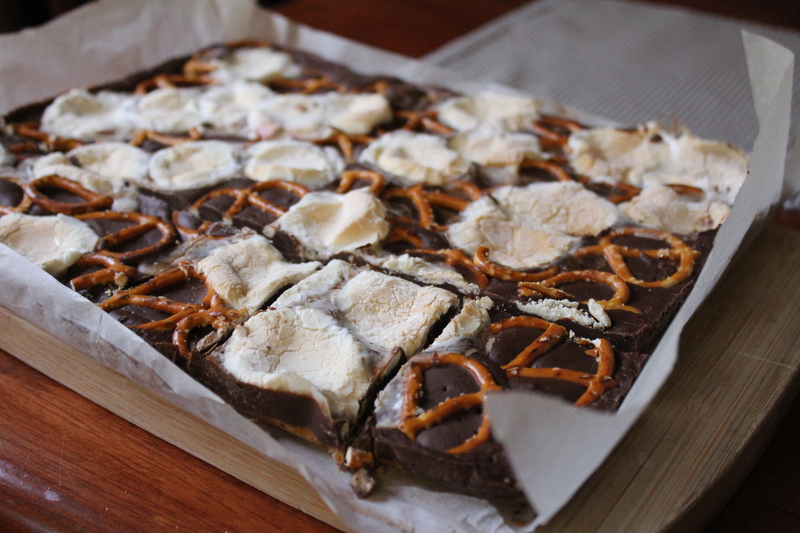 The marshmallows were sticky and sweet and contrasted really well with the crunch of the pretzels. As for the peanut butter and chocolate combination, how can you go wrong?! And because I took the slice to a party and shared it, I didn’t end up eating half the tray myself and feeling really guilty! That’s a win. 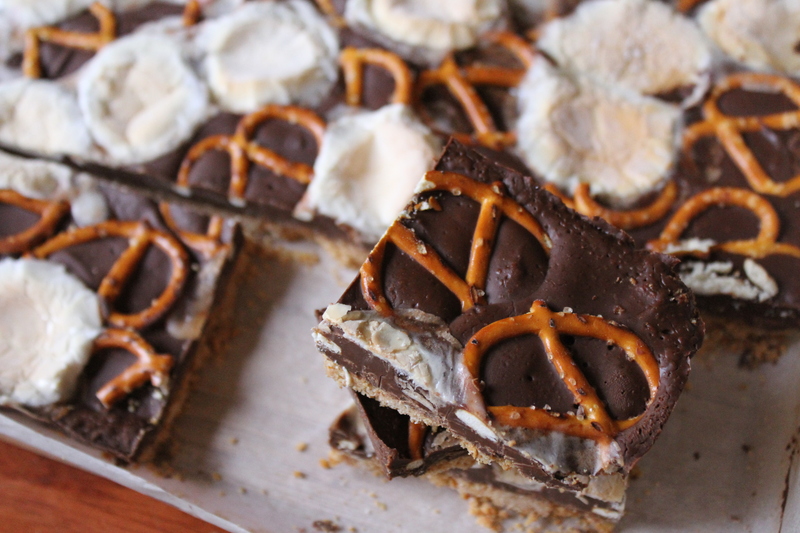 This entry was posted in Food and tagged Chocolate, Food, Marshmallow Pretzel Peanut Butter and Chocolate Slice, Party food, Peanut Butter, Slice. Bookmark the permalink. Thank you again so much for making this! So delicious!